You may also be interested in grabbing a poster map of Watopia. How do I ride these courses? Since there is no in-game radar or overview map, it’s very confusing. Are cue sheets available? Which turns do I take at which times? You choose your route when you start your ride–there’s a pulldown menu for your preferred route. So if it’s a Watopia day and you choose “Figure 8” as the preferred route, the system will automatically navigate correctly for you as you ride. If you switch your view while riding it gives your more perspective. You will start to recognize where you are quickly and understand the terrain better. Great job ! Thank you for that ! I love doing this way more than riding outside! Love these maps gentleman…hat’s off to you! I don’t get an option to choose which configuration, I just get ‘Watopia’ or ‘Richmond’..? Not figure 8, pretzel, etc. Can you change course selection mid ride? Hilly to flat? I know this is pretty obvious, but there’s a potential gold mine in selling add-on real-world courses. I know I personally would pay a modest one-time fee ($20?) without blinking for a Zwiftified version of the half-iron course I’m doing in July. I’m on the fence right now between Zwift and another structured workout platform and real-world courses would easily put me in the Zwift camp. Just throwing it out there. Would love to see Kona ironman course. How soon can you make a verified segment for the new ‘Volcano’ course? I believe it is scheduled for release 12/25/16. It looks cool from the GCN screenshot. I’ve ridden mountain route, but would like to do it in reverese – is it possible to select mountain route – reverse rider and just ride course backwards automatically – i.e. without manually taking appropriate turns? 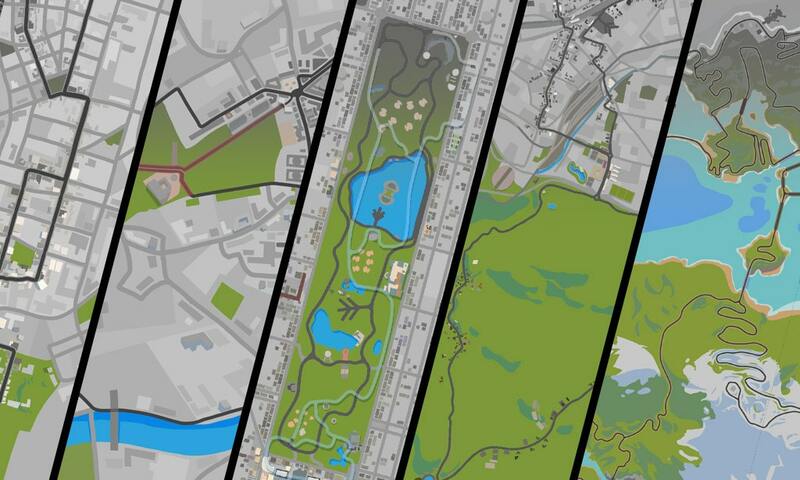 It would be quite handy if you would have a PDF view map of Richmond and the new London courses, as you do with Watopia. It is very confusing when selecting a route. For example re London. The “London Loop”, “London 8” and the “PRL Full” really mean nothing if there is no information available. The clever Watopia PDF map leaves no question as to where the various routes go. Is this something that we should expect in the future? I can’t promise a PDF map, although I’m not saying “no” either. It’s a lot of work, and until I’m sure that Richmond and London will be in use for a long time I don’t want to put in the time to make the map. If I want to see any route on Zwift this is my first port of call. Your efforts are really appreciated Eric – thanks!!! Awesome once again really appreciate this. The London Loop elevation gain is more than 499′. I rode just under two loops and got 1,312′, and it doesn’t make sense that Loop(499′)+Classique(62′) is so different from London8(780′). I’m guessing that it’s somewhere around 700′. You are correct–not sure why I had that number wrong, but I just updated it to what Strava shows, which is 220 meters (722′). Thanks! You’ll need to send that request to ZwiftHQ… I just write the blog! Thanks for this Eric. 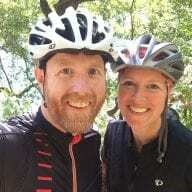 I’m new to zwift and your site has been extremely helpful and informative!! 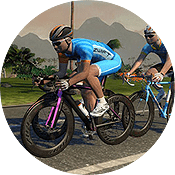 Hello, I’m new to zwift and using it for training for a big endurance race next summer. I was wondering if it’s possible to change in the middle of a ride to ergo mode? I know it’s not part of the game but it would be helpful for my training. For example if I choose flat ride which is good for my single leg training so I can work on individual watts per leg, then I want to do 15 minutes of stand up climb training, but there isn’t enough resistance because I’m on a flat route. Would it be possible in this situation somehow, maybe with the phone app, to get the ergo mode on so I can increase the watts for a climb? Thanks for your help. I would love to 3D-print these routes. Is there a file to download? is there a preference setting to view these maps in Mile instead of KM? Will ot not be possible to put a see through map on the screen that moves as you bike showing your position? Some where around here saw a way to make Zwift Routes selection wider than just the schedule ones and few choices on then. It was about changes on the scripts so we can choice even reverse routes. could you please email me the script changes I;m talking about? or the link to see them. What’s the best route for the FTP test? The route doesn’t effect your trainer tension at all, so it’s really just a psychological thing. Do you feel better riding hard uphill? Time it so you are on the Epic KOM and radio tower climb. I wouldn’t recommend one with a lot of downhills, since it “feels” harder for most to keep up the wattage when your brain says you can take it easy. I generally just do the flat route for FTP tests. Keeps it simple. I’m new to zwift. If I pick a route, can I pick a spot to start the ride? Is there a mark to say I finish the route? How do I know that I am on the second or third loop? Nope. You’ll always start the route at the same place. Some routes include a lap counter. Those are usually routes that have short laps (jungle circuit, volcano loop, London classique, etc). I’m new to zwift also and haven’t found out yet how to pick a route. I’ve only been able to do the London bit so far. How do I get to “Richmond” or “Watopia”? Hi, I’ve done a Pretzel variant that I named “Volcanic Pretzel”. It’s the Pretzel with the road in each way of the new Vulcano extension. For now the longer and harder road on Watopia. You can see my activity here: https://www.strava.com/activities/900397692. When do you think you’ll be able to add the Volcano climb? Is there a way I can see where I am in the overall Map of where I am cycling in real time? Just a heads up… When I hit this page on Google Chrome your veloviewer embeds are not showing. I believe this is because your sidebar links to the HTTPS version of this page, but you are embedding veloviewer with HTTP URLs, which causes Chrome to block the veloviewer embeds. Looks like veloviewer can do HTTPS so hopefully it’s easy to change those URLs on this page. Hi, will you be adding the Volcano Climb (23.4km, 204m elevation) as a Strava segment in the future? Just a question to the starting points in Watopia. Is “Start Gate” and “Start Pier” the same location? Is it possible to start from the “Start Pier” without joining a group event? You might want to update one bit of text – the Watopia Flat route is now no longer the flattest route available. That crown is now owned by the Volcano Flat route which has less elevation (I’m guessing because it doesn’t do the Esses) and is longer as well. Has the London Pretzel changed with new extension now ? Is there a new course called Watopia Mega Pretzel? I see thius as the course for this weekend’s Zwift Gran Fondo. When using the Zwift Map app, the Innsbruck map only displays as the routes with 0% background. I am unable to increase the background map. I seldom select anything other than 0% but with a new world or course, I wanted to see some of the landmarks. When will the Innsbruck Map be available as the other three destinations? It seems like the Lady Liberty Zwift insider segment isn’t available. The only way to start from the “Start Pier” would be to join a group event and then do your own thing anyway. They cant force you to ride at their pace and you may be able to go the other direction at junctions. I spawned a lot closer to the loop than the description here – I only think I rode about 3 km before I was on the loop. So it seems they have changed the spawn point since this description was made. You are correct–my mistake was to use the distance/elevation from the “from the start banner” segment, when I should have just used the Jungle Circuit segment numbers. I just updated it. Thanks! Hi Eric, Great work with zwiftinsider…it is an awesome resource…especially this course maps and details webpage. Just an FYI in case you are not aware…ever since the New York additions were made to this page the webpage crashes on Iphones and IPads with latest IOS. Loads some of the page before crashing and then ‘problem repeatedly occurred’ message comes up.Works on Windows desktop fine though. Worked fine on Safari on iphone/Ipad before. Might be some compatibility issue with the veloviewer topo maps as that seems to be the only new feature? Is there a way and/or a means of finding out on which dates I changed levels?